What do you enjoy the most about long weekends in the summer? Sleeping in? The extra day off? Relaxing by the pool or lake? Spending it with friends? The food? One of my favorite things is waking up knowing I don't have to rush the kid's to a weekend activity. And of course the smell of a hot breakfast!!! Bacon and eggs. Cinnamon French toast. Pancakes. It's all good! Just thinking of those aromas makes me smile! It's a welcome break from my regular bowl of boring cereal. When I'm the one making breakfast on a long weekend morning, I like to prepare omelettes. And I get excited when I find new ways to whip them up! Earlier this year I learned you can add flour and baking soda to the mix and turn an omelette into a pie. It opens the door to what you can create from omelette batter. 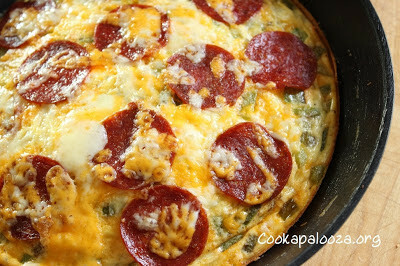 You can change the way you serve your signature western omelette or make it look like a pizza pie! An idea to keep in mind for a long weekend breakfast this summer! 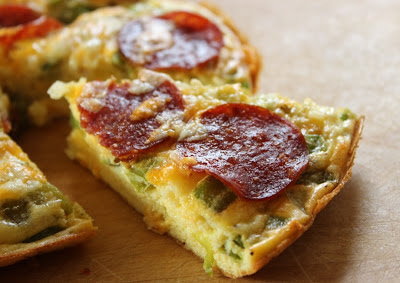 This Friday in the newsletter (I'm sending it out early due to the Canada Day long weekend) I'll share with you a tasty an exciting way to prepare and serve omelettes to guests! They look like a breakfast you'd see served at a fancy resort. Thankfully they're very simple to make! In a large bowl, whisk together water, flour and baking powder. Add eggs, hot sauce, salt, pepper and whisk again. Stir in 2 tbsp of cheese. Set aside. In a 10-inch oven-proof non-stick skillet, heat oil over medium heat. Add onion and bell pepper. Cook and stir until onions and peppers begin to soften, about 3 minutes. Remove skillet from heat. Slowly add egg mixture to skillet. Give it a stir to evenly combine ingredients. Place in oven and bake for 10 minutes. Carefully remove skillet from oven (that handle is hot). Evenly place pepperoni slices on top and sprinkle with remaining cheese. Place skillet back in oven and cook for 5 minutes more. Set the oven to broil for the last 2 minutes if you would like it slightly browned on top. Carefully remove from oven and slide omelette out onto a cutting board. Cut into slices and serve.